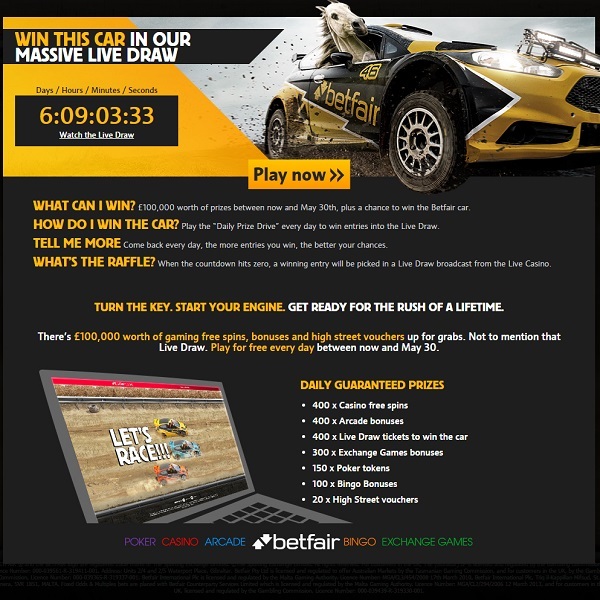 This week players at Betfair Casino can win thousands of prizes in in the Daily Prize Drive promotion and one lucky member will be walking away with a new car. Members simply need to go and play a special racing game where they pick a driver and watch a race. If their driver wins the race then they will receive a prize. There is £100,000 worth of prizes to be won in the form of free spins, bonuses and high street vouchers. Each day 400 free spins will be given away, 400 arcade bonuses, 300 exchange games bonuses, 150 poker tokens, 100 bingo bonuses and 20 high street vouchers. Furthermore, there will be 400 live draw tickets given away each day. The live draw is taking place on Sunday 31st May at 9pm BST and the winner of the draw will receive a Ford Fiesta ST.